I’ve been loving the Industrial and rustic look for a long time now and thought it might be fun to put together some of my ideas on what you need to create an authentic industrial look in any home. Would this look work for you? Neutral Colour Palette – start with some greys in various shades, or stick to off whites and that will mix well with natural tones of wood and leather. Dark, Inky Walls – add a dark, almost black feature wall to give the look depth and character. Brick Wallpaper – it’s been around for a long time but is still really popular. If you’re not a fan, think about doing this next one. Brick Veneer – expose the walls and add bricks like Vintage Revivals has been doing recently. Industrial Walls – alternatively add some authentic wallpaper. Check out this post from last week and see how the Brooklyn Tin Tiles paper could look for your industrial theme. Reclaimed Flooring – keep it natural and organic by exposing original wooden flooring or laying something like parquet. Stone floors – Natural slate or stone floors in dark colours are perfect for this look. Cover them with lots of rugs to aid warmth. Rugs – add texture with by using sheepskin rugs on chairs, benches and sofas as well as the floors. Metallic lighting – simple, old fashioned metal light shades and industrial looking wall lights add a really authentic finish. 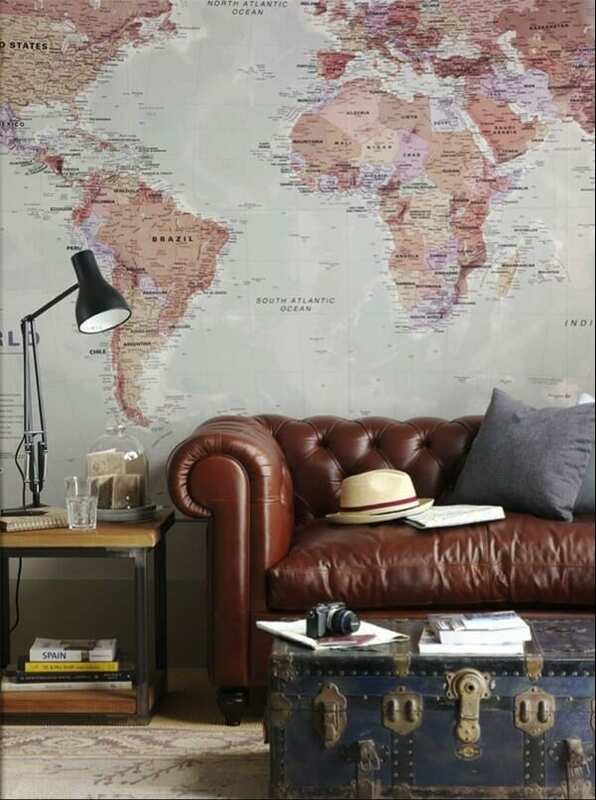 Maps Wall Art – maps are the ideal accessory for this look, and framed, they look striking, particularly if printed on vinage paper. Metal Filing Cabinets – one of the archetypal furniture accessories necessary to make this look work. Hunt them down on ebay or at auctions. Upcycled Wooden Pallet coffee table – this post here is one of my most popular and some of the pieces would look great in an industrial theme. Collection of Stag Heads – whilst these aren’t for everyone they can look really impressive and help complete this look. Rustic Basket Storage – add a little rustic touch with some rattan or wicker baskets for newspapers and magazines, throws or logs. Vintage Typography Art – a great way to decorate walls using prints in bold font on aged paper. You could even create some yourself. Selection of Metal Dining Chairs – again you can pick these up at auctions or on second hand sites, think old school dining rooms and you’ve nailed it. Oversized Feather Cushions – lots of squishy, comfy cushions in bright colours on your Chesterfield sofa will soften the look and give it a practical edge too. Hang an Overly Large Clock – it’s quick and easy and makes a real statement on any wall in your home. Use old School Chests for storage – these have become more difficult to get hold of, but if you have one lying around from your college days why not put it to good use in your decor. Previous Post Is Your Home Safe and Secure? The industrial look is by far and away my favourite and dark walls, old furniture and large clocks run throughout my house! Thanks for pulling the main themes together! The industrial look inspired me so much! Chesterfield sofas and rugs seem to be very expensive, but that’s only delusion 🙂 I have recently found many vintage things on the internet. I am going to buy a leather sofa on slf24 and some details on markandspencer. Can’t wait to redecorate my flat! Such an inspiring post Jen. I was browsing around and found your blog post for my next project. I like the rustic basket storage idea. It’s good to make the room to look a bit old and bring back past memories. That industrial look is just awesome and unique. Its something that would really look good in a bungalow. I am thinking of adopting such a design into one of our vacation homes. Thanks a lot for sharing this. i love the industrial look, thanks for sharing !